Eden Hazard of celebrates after scoring his team's first goal with his team mates during the Premier League match between Chelsea FC and West Ham United at Stamford Bridge on April 08, 2019 in London. If Eden Hazard is really off to Real Madrid in the summer, then on Monday night’s evidence, Chelsea are really going to miss him. At times this season, it’s felt as though Hazard has taken this Chelsea side on his back and carried them to victory. On Monday night, he was at his unplayable best and his two goals gave Chelsea a 2-0 win over West Ham United and catapulted the Blues back into third place, albeit having played one game more. 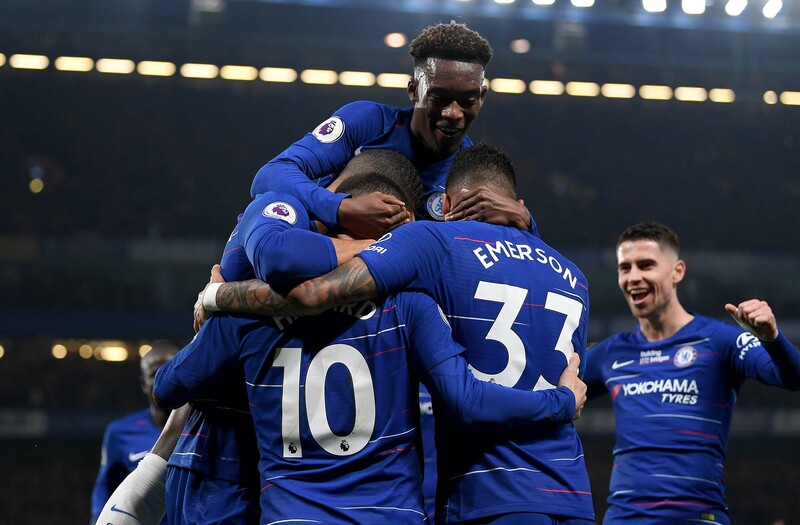 There was a certain feeling of energy and dynamism in the team with Ruben Loftus-Cheek and Callum Hudson-Odoi again named in the starting 11 after their performances against Brighton last Wednesday night, but it was clear early on that it was going to be Hazard’s night. The Belgian issued his first warning to West Ham just 10 minutes in when he played a quick one-two with Gonzalo Higuain to free himself through the right-hand channel, forcing Angelo Ogbonna concede a booking just to stop him from racing clear on goal. His first goal was the type of goal that few players in world football could put away. Hazard collected the ball in a pocket of space outside the West Ham area before driving past Mark Noble and Declan Rice. A quick little shift of the ball allowed him to zig-zag between Fabian Balbuena and Ogbonna before placing a shot beyond Lukasz Fabianski before Ryan Fredericks could intervene. Minutes later, Chelsea nearly scored when Hazard clipped 40-yard pass over the West Ham defence for Higuain. But with the angle narrowing, Higuain’s shot cannoned off the inside of the post. Hazard should have had a penalty just before the half-hour mark when Marko Arnautovic body-checked him inside the penalty area. Hazard collected the ball just inside the left side of the penalty area and with West Ham defenders panicking, Arnautovic shouldered him off the ball. Hazard appealed for the penalty since Arnautovic hadn’t played the ball, but Chris Kavanagh wasn’t convinced and play continued. Chelsea continued their dominance to start the second half but once again had a small spell where they seemingly lost all focus. West Ham should have equalised with their first real attack in the match when Felipe Anderson played a brilliant diagonal ball for Arnautovic, who had moved centrally to replace the ineffective Javier Hernandez. Arnautovic drew the attention of both Antonio Rudiger and Emerson and laid the ball off into the empty space for Manuel Lanzini, forcing Kepa Arrizabalaga into his first save of the match. Undaunted, Chelsea regained their focus and control of the match, and Loftus-Cheek began to come to life. First, the midfielder darted through on goal from a pass from Higuain only to clip the ball straight at Fabianski. Then Loftus-Cheek slipped a pass through the West Ham defense, but Hazard and Hudson-Odoi both attacked the pass looking for a shot, and Hazard’s shot deflected off the toe of Hudson-Odoi. Ross Barkley and Olivier Giroud both had opportunities to score tap-ins at the far post but couldn’t connect, before Hazard put the game to bed just before stoppage time. Collecting a pass from Ross Barkley, Hazard settled the ball and stroked a first-time shot inside the far post for his and Chelsea’s second. A hat-trick would have been put the finishing touches on a brilliant night, but N’Golo Kante failed to send Hazard through on goal in the second minute of stoppage time.